Historically speaking, The Original Los Angeles Flower Market has a proud heritage and family history that span nearly an entire century. Inspired by the success of local Japanese-American growers who had established the city’s first major flower market in 1912 (the Southern California Flower Market), the organization that would ultimately be known as The Original Los Angeles Flower Market was founded in 1919 as the American Florists’ Exchange by a group of 30 enterprising European-American growers. Seeking a more efficient way to sell and distribute their freshly grown, highly perishable flowers to local florists and nurseries, the fledgling American Florists’ Exchange set up shop in a garage on Winston Street near Fifth. 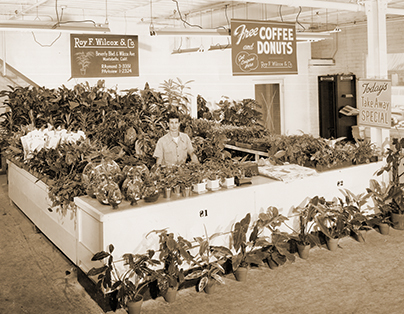 In 1921, led by Tom Wright, the group officially incorporated themselves as the American Florists’ Exchange, Ltd., dba The Los Angeles Flower Market, and subsequently moved their operations to South Wall Street. Many legendary pioneers of the L.A. floriculture industry were among the group’s original founding members, which included: Ernst Amling, Walter Armacost and Fred Royston, J.C. Bodger, Paul Ecke Sr., H. N. Gage, W. “Pop” Godfrey and Donald Biggs, Albert Goldenson, C.J. Groen, Gebhard Prechtl, Herman Seidler, W.J. Jacobus, Vander Bruggen, C.P. Von Herzen and Roy Wilcox. 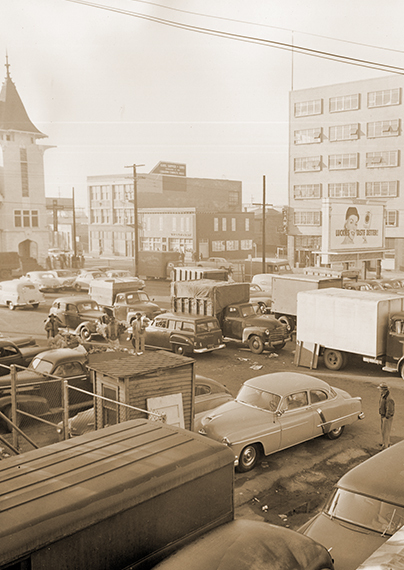 As L.A.’s two major flower markets grew and prospered in the early 1920s, they both relocated to more spacious quarters—across the street from each other—on the 700 block of South Wall Street. The decades that followed brought with them years of innovation and growth, as advances in the areas of horticulture and greenhouse technologies, refrigeration, transportation and communications made the floral industry a truly global enterprise. Over time, as the Los Angeles area’s population and real estate prices continued to climb, many growers moved their primary operations to the north, the south or even out of the country to become more cost-efficient—and cost-competitive—with the growing wave of imported cut flowers. Through it all, The Original Los Angeles Flower Market has continued to adapt, evolve and to thrive by putting the needs of its loyal customers commercial and retail customers first. Currently, The Original Los Angeles Flower Market’s 50 member/vendors offer more than 125 different varieties of cut flowers plus an impressive portfolio of related foliage and floral accessories. Equally significant, in 2011, The Original Los Angeles Flower Market has “gone solar”—transforming its main facility into a modern, solar-powered showcase for the floral offerings grown in over a dozen different countries. Today, The Original Los Angeles Flower Market shines brightly as the “heart” and geographical center, of the world-famous Los Angeles Flower District—the single largest and most successful wholesale floral district in the entire United States. Vawter Carnation Fields opens a Los Angeles flower market on Spring St. The Ecke family begins growing chrysanthemums and poinsettias in the area. In Los Angeles, a group of future-minded European-American flower growers and wholesalers led by Tom Wright establish The American Florists’ Exchange. 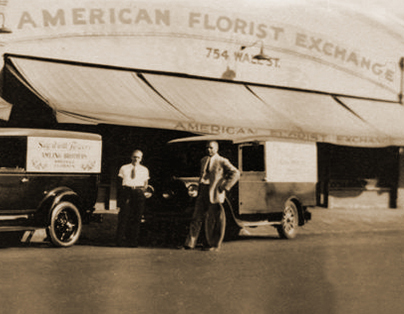 The American Florists’ Exchange, Ltd. is incorporated, dba The Los Angeles Flower Market, and move their headquarters to S. Wall St.
G. Mellano moves from San Francisco to Los Angeles and starts Mellano & Co. The Amling brothers are the first Californians to be granted a rose patent (for their Red Talisman). L.A.’s floriculture industry begins evolving into a broad network of local and regional growers, wholesalers, retail florists and shippers. The wholesale value of Los Angeles-grown cut flowers reaches $13.5 million. The Bloomin’ News, a popular industry newsletter, begins publication. George Berlin pioneers the selling of cut flowers to supermarkets. San Lorenzo Nursery becomes California’s first grower to have over 1 million sq. ft.of greenhouse space. The wholesale value of Los Angeles-grown cut flowers exceeds $20 million. Over 50% of California’s flowers are shipped out of state. Advances in transportation and refrigeration open the door to an array of imported cut flowers. Many growers move north, south or out of state. Over 125 different varieties of cut flowers sold at The Los Angeles Flower Market. The Los Angeles Flower Market boasts 29 member/vendors. Bob Garren establishes the Floral Delivery Service Co-Op. The Internet revolutionized key aspects of the floriculture industry, including wholesale and retail ordering, tracking and delivery. The Original Los Angeles Flower Market opens its doors to the general public for the first time. Los Angeles establishes the “Fashion District” Business Improvement District—which includes the Los Angeles Flower District. The Los Angeles Flower District “Badge Program” is initiated for industry members. Annual worth of California market cut flowers and foliage estimated at $330 million. The Original Los Angeles Flower Market “goes solar,” adding state-of-the-art solar panels to the roofs of all eight of its interconnected main buildings. The Original Los Angeles Flower Market, along with the Southern California Flower Market, have become “the heart” of the world-famous Los Angeles Flower District, the largest, most successful wholesale Flower district in the entire U.S.